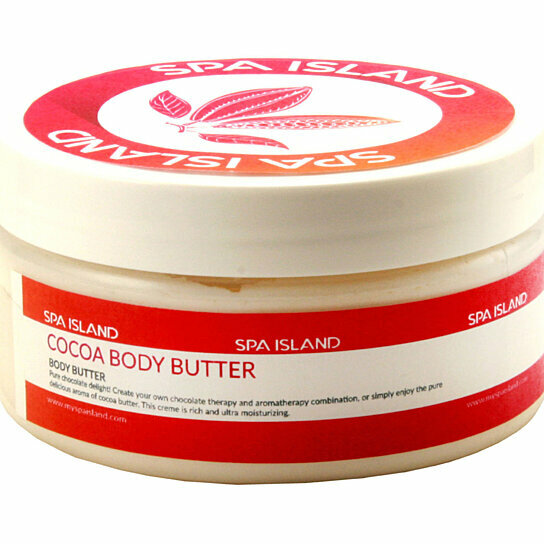 Have the power to uplift your spirt and enhance your senses with Spa Island's Body Butter using rich organic ingredients. Body butter cream leaves your skin feeling silky smooth, moisturized and healthy. Scents include Cocoa, Mango Lime, and Calming Lavendar. Cocoa butter reduces stretch marks. Mango Lime is deep hydrating, earthy, and refreshing. Calming Lavender is soothing and calming. All blends include natural cocoa, coconut oil, aloe, shea butter, mango butter and jojoba oil with the finest and purest essential oils that nature offers. Earth Friendly. 5.7 ounces. Due to the personal nature of this product we do not accept returns. Scents include Cocoa, Mango Lime, and Calming Lavendar. Cocoa butter reduces stretch marks. Body butter cream leaves your skin feeling silky smooth, moisturized and healthy. Cocoa butter reduces stretch marks. Leaves skin feeling silky smooth.Scents include Cocoa, Mango Lime, and Calming Lavendar. All natural oils. Deep Hydrating.